Ducted Air Conditioning Unit vs Ductless: What’s Best For You? Taking on a commercial renovation project comes with an overwhelming number of decisions that need to be made. You probably feel comfortable making some of those choices, such as choosing the most functional layout or even selecting furniture. But as a business owner, you may feel less than qualified to decide on the right HVAC system for your new space. A ducted air conditioning unit or a ductless one? You’re not an HVAC expert; how are you supposed to know what’s right for your space? If you’re being pressed for a decision without fully understanding your options, you’ve come to the right place for help. Here’s some basic information on the ducted air conditioning unit and the ductless system, to guide you in making the best choice for your business. Looking for restaurant kitchen design ideas? You’ve come to the right place. Arista has done restaurant HVAC, refrigeration and kitchen repair for many years (decades, really) so we’ve been involved in countless restaurant startups and renovations. In the process, we’ve learned quite a few useful tips. Here goes! What exactly is a make up air unit for a kitchen? When you add a make up air unit for your kitchen, it adds replacement air for what’s being drawn out of the kitchen by your exhaust hoods. What is make up air? Simply stated, a make up air unit pulls air in to your space from outdoors and conditions it to the indoor temperature, to replace air that’s pulled out by your kitchen exhaust equipment. Without it, you get back drafting, poor temperature control, negative air pressure and air quality problems. Let’s explore the reasons why a make up air unit is so essential for restaurant kitchens. Why is Make Up Air Important for Restaurants? Depending on the type of cooking you are doing, you might even have more than one exhaust system in your kitchen: one for heat & grease generating cooking appliances (like fryers, grills, and cooktops) and another for steam-generating appliances (such as dishwashing equipment and baking ovens). Restaurant kitchen exhaust systems are often very powerful, removing thousands of cubic feet of air per minute. When air is removed from your kitchen, it needs to be replaced with fresh air. Without that replacement air, you wind up with all sorts of unpleasant and even dangerous conditions, which we’ll get to in a minute. The problem is compounded in newer buildings constructed to be air-tight, which prevents the natural flow of outside air into the space. If you’re setting up a restaurant kitchen for the first time, or even renovating an existing kitchen, you probably don’t have to do much research to choose your kitchen’s cooking appliances. After all, food is your thing. Changes are you have known exactly what you want for a long time. But what about your commercial kitchen exhaust hood? Air flow is probably not your thing. And when you start to research your options, you quickly discover that there’s a lot more to it than you thought. So here’s a quick primer that can help you choose the commercial kitchen exhaust hood that’s perfect for your food service establishment. As a provider of HVAC, refrigeration and kitchen equipment maintenance to NYC restaurants for decades, we’ve been involved in lots of restaurant renovations and build-outs. Over the years, we have learned a thing or two about what NOT to do when creating a restaurant kitchen design. Whether you’re remodeling or opening a new establishment, avoid these bad practices that can cost you big time. Those in charge of corporate office facilities, and tasked with reducing operating costs, are painfully aware of one fact: even modern HVAC systems can consume as much as 30 percent of a building’s energy usage. What if your facility already has efficient, modern HVAC systems in place? How can you get them to consume even less energy in order to reduce cost? The answer lies in running your modern HVAC systems only when and as much as they are needed: when people are actually using the space being heated and cooled. When you take a walk through your office space on a typical day, you can’t help but notice how much space is empty. That’s because of the changing nature of today’s mobile workforce. More and more people are working from home, on the road, or wherever they happen to be. Yet the traditional HVAC system pumps out heated or cooled air regardless of whether or not any one is even using the space. What if you could control your HVAC system according to actual demand? The Rooftop Air Conditioner: How Does It Work for NYC Spaces? It’s the beginning of the year: the collective time to evaluate what’s working and what could be working better. Even business owners, the expert inventory-takers, are going one step further to ask questions about the items that get the least attention. “Does my current HVAC system make sense for my business?” or “How often does my rooftop air conditioner need to be serviced?” may not even make the list! We’ve taken the time to simplify the basics for answering these questions to help your yearly planning run a little more smoothly. For retail businesses, comfortable conditions in your store are directly related to your bottom line. No one wants to shop in a store that’s too hot or cold, especially in the city where there’s another great store just down the block. If your retail store is experiencing issues after a new retail HVAC system is installed (or even repeated issues with an older system that’s been in place for a while), you might wonder why you have these problems that your counterparts working in offices don’t seem to experience. The truth is, office experience different problems, because the environments are different. HVAC problems in a retail environment can be tricky to diagnose and fix, and that’s why you need retail HVAC experts to get to the root cause of your issues and find the right equipment to keep your space consistently comfortable. If you own or manage a popular restaurant in New York City (or anywhere, really) you know that staying open is crucial to your bottom line. Not only do you lose money every hour that you’re closed, but your regular customers are forced to go elsewhere… and the last thing you want is for them to discover a new favorite. That’s why it’s a major decision to undertake a renovation or replacement of mission-critical systems (such as an HVAC system installation) that will force you to close your doors for any period of time. When you do finally decide to bite the bullet and do a renovation or equipment replacement, the schedule must be meticulously planned to be completed as quickly as possible. There’s no margin for error, contingency plans or time built in for delays. Everything has to go right so you can open again ASAP! But the fact is, things are going to go wrong during any major renovation. So here’s your contingency plan: only hire vendors who are committed to the schedule. When it comes to the HVAC system installation, the trick is to find a company that will do what it takes to overcome obstacles and get the job done on time. As a Facilities Manager, you’re dealing with many different service providers for your company. Yet choosing an HVAC company can be one of the most challenging, especially if you don’t happen to be an HVAC expert yourself. Obviously, you want an HVAC company with the expertise to solve your heating and cooling issues quickly and reliably. But you also want a company that offers great customer service and is easy to do business with. How can you find all these qualities? Ask about these 8 things when you evaluate a prospective HVAC provider for service, installation and/or repair work. If you’re in the food service business, you know that maintaining comfortable conditions in your restaurant is a must. It’s never okay to allow your dining room to become too hot, cold or humid. You also can’t have too much equipment noise disturbing your customers. Then there’s the problem of drafty conditions or even kitchen smells being pulled into the dining room by a poorly-functioning restaurant HVAC system. Any of these problems can cause you to lose customers and impact your bottom line. Are you looking to save energy? If your business has an older heating and air conditioning system that’s driving up your energy expenses, you might be considering replacing your equipment. But what if you’re not in a great financial position to take on such a large capital expense right now? Or what if you’re considering moving your business to a new location in a couple of years? There are situations where replacing your HVAC system to save energy doesn’t make financial sense. Then there is the issue of changing refrigerant regulations: you might be reluctant to invest in an expensive new system right now without knowing for sure which refrigerants will be phased out. Does that mean you’re stuck with those escalating energy costs until you’re in a position to replace? Not necessarily. The good news is, there is another way to save energy: by retrofitting your existing HVAC equipment with energy-efficient add-ons. Remember when the term “smart” only applied to people? Today it seems like every inanimate object has the capacity to be smart: first it was your phone, then your TV. Now the Internet of Things (IoT) has made it possible for just about everything in your home or business to be “smart” as well. That “smart” revolution is happening in the world of HVAC controls as well. You have probably heard about “learning” thermostats for your home, and maybe you even have installed one of these handy devices that lets you control your home’s temperature from your phone or computer. Yet there are even more benefits when small businesses upgrade to smarter commercial HVAC controls. If you’re reading this article about air conditioning in January, then kudos to you for being a smart and proactive thinker. Many business owners and managers would rather put off the problem than tackle their air conditioning issues in the middle of winter. Yet January is an excellent time to replace that unreliable air conditioner that gave you trouble all last summer since you now have time to thoroughly research your options. You can get reduced prices at this time of year as well. This is a perfect time to educate yourself about the types of systems that are best suited for your business. If you own or manage a restaurant, we’d like to introduce you to the variable refrigerant flow, or VRF cooling system. VRF systems have been the HVAC system of choice for decades in other parts of the world, and are now becoming very popular in the US for certain types of spaces, including restaurants. If you’re a business owner in the market for a new light commercial HVAC system, you have probably realized that the cost of the equipment is not the only factor you need to consider. The commercial HVAC installation cost can vary widely from one installation vendor to another. So how can you compare quotes and understand exactly what you’re paying for and what you’re getting for your money? Since you’re probably not an HVAC expert, it can be a challenge to understand the quotes and what’s included. Here’s a primer about commercial HVAC installation cost to help you compare options, understand why prices differ, and ultimately decide which proposal is right for you. With all the safety risks that are lurking around your building, you may not think of your air conditioning system as dangerous. Yet most air conditioning systems, VRF systems that provide heating as well as cooling, and commercial refrigeration systems rely on refrigerant chemicals that can be deadly if an accident happens. When you are responsible for building systems and the safety of your building’s occupants, you’d better understand refrigerant safety guidelines to make sure a tragic accident doesn’t happen on your watch. Here’s what you need to know about refrigerant safety and your HVAC equipment. Since Superstorm Sandy devastated New York City, it’s no secret that NYC is extremely vulnerable to storm surge and wind damage in a hurricane. We all lived through it and we know firsthand what can happen. The National Oceanic and Atmospheric Administration (NOAA) has predicted 6-11 named storms, including 3-6 hurricanes and up to 2 major hurricanes for the 2015 season. And as we all know, it doesn’t even have to be called a “hurricane” to inflict severe damage. So if you’re like most New York City business owners, you can’t help but be a little nervous when hurricane season rolls around again. But sometimes a little anxiety can be a useful thing, if it motivates you to get prepared. If you’re in the process of renovating a commercial space in New York City, you know how much planning goes into the project. Architects, engineers, builders and contractors all do their parts to ensure that the space looks and functions according to the client’s requirements and can be completed within the allotted budget and time line. In spite of that, one of the most important aspects of planning a renovation is sometimes overlooked: HVAC design. Does your building still have the old dial thermostats? If you’re looking for a way to save money on your energy bills, consider upgrading to new thermostats with programming capabilities. It’s a relatively low cost way to cut expenses on your heating and cooling bills without sacrificing comfort. Today’s new thermostats even provide convenience and notification features that make it even easier to save money. How much can you save? According to the US Department of Energy, you can save between 5 and 15% on your heating bill when you set back your building’s thermostats by 10 to 15 degrees during the periods when your space is unoccupied. Related article: 15 Tips to Keep Your Energy Bills From Skyrocketing This Summer. The trees are budding, the grass is poking through the ground, and the warm weather will be here before you know it. While this is good news for most, you might be dreading the warm days ahead if your air conditioning system barely made it through last summer. If your unit is held together by paper clips and is barely producing cool air, it’s time to start thinking about replacing it before the seasonal rush. If you’re about to undertake a major renovation project in your building, you’re probably both excited and anxious at the same time. On one hand, the new space will make life easier and enhance your business. On the other hand, living through the construction is a major pain and there are so many details to consider that you may be feeling overwhelmed. Take Control of Your Broken Air Conditioning Unit. As a business owner or manager, you wear a lot of hats. But it’s going a bit too far when you’re expected to understand the technical mumbo-jumbo about what’s wrong with your broken air conditioning unit and make a decision to replace it on the spot. Do you trust this service provider and their diagnosis? Is this problem really a death sentence for your equipment? Can you buy a little time to figure out your options? Just say no, or at least say “not so fast.” Any service provider that insists you need to purchase new equipment without offering an adequate explanation – or one that’s understandable to someone who’s not an HVAC expert – should raise a red flag. You should never rush into making an expensive equipment purchase, because it’s easy to make the wrong choice and spend more money than you need to. HVAC Repair: 3 Scenarios Where You Might Pay Twice. When should you pay twice for HVAC Repair in NYC? You know the drill: something breaks and you call in someone to fix it. The HVAC repair guy tells you what’s wrong, and charges you a lot of money. At first, everything seems to be working again. You breathe a sigh of relief and forget about it. Then lo and behold, it breaks down again a short time later. We’ve all been through it, which doesn’t make it any less frustrating, not to mention expensive. Unfortunately, it happens all too often with air conditioning systems. The question is, should you have to pay each time the tech comes out and works on your system, even when he doesn’t fix the problem? When a service tech inspects your broken air conditioner, the very LAST thing you want to hear him or her say is, “Sorry, the compressor has failed.” It’s often a death sentence for an air conditioning unit since it’s such a costly part to replace. If your warranty has expired and the cost to replace a compressor exceeds a third of the cost of a new unit, you may be facing the purchase of a new air conditioner. Either way, it’s going to cost you a bundle. If you have children, or you’re alive on the planet, you’ve seen/heard of/know all the words to all the songs to Disney’s Frozen. In the movie “Anna, a fearless optimist, sets off on an epic journey – teaming up with rugged mountain man Kristoff and his loyal reindeer Sven – to find her sister Elsa, whose icy powers have trapped the kingdom of Arendelle in eternal winter” (so says IMDB). Yea, it’s a real nail-biter. Air Conditioning Problems: Repair or Redesign a Noisy AC Unit? Is Your Noisy Air Conditioning Unit Broken or Poorly Designed? Know the Signs. Do you feel like that rattling or humming sound coming from your air conditioner is beginning to rattle your brain? It’s not just you. Everyone in the building has noticed: your employees, your customers, and your boss. If you’re in charge of the air conditioning system, they’ll have your head before too long if you don’t do something about it. It’s an age old question: how can you tell when a piece of equipment has outlived its useful life? Can you get your older unit to last another couple of years by fixing it, or will you have to continue putting money into it? Newer units are more energy efficient and can lower your electric bill, but what about the upfront cost? According to the International Facility Management Association, temperature is the #1 number one complaint expressed by office workers. So how can you make sure your building temperature is comfortable and worker friendly? Typically, simple updates to your HVAC system can help solve the problem, but sometimes it takes a redesign to make a world of difference. Nearly 40% of HVAC systems are between 16-30 years old. Knowing this, it’s easy to see how, if not properly maintained or updated, systems can pose their own sets of problems for workers beyond just heating and cooling variations. A redesign may be much needed.We’ve created this simple infographic to help you quickly get on your way to a stress-free redesign. Small changes to your HVAC system are often the key to improving temperature variances. So before considering a redesign, check with your service provider for minor adjustments that can pay big dividends, now and into the future. Want more tips? 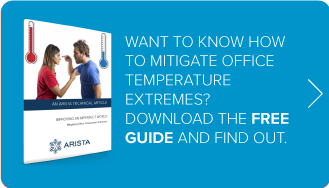 Download Improving an Imperfect World: Mitigating Office Temperature Extremes. Don’t waste time and money. Find out how easy it can be take control of your building’s climate!